This addon just adds the possibility to choose your guild bank / guild store from the guild bank / guild store selection popup by using the keys 1, 2, 3, 4, or 5. As you can guess key 1 will select guild 1, key 2 will select guild 2, and so on. Pressing the ESC key will close the selection popup now. NEW: You are alos able to select your guild by the mouse wheel now! If you reach your maximum guild it will continue with guild 1 again, and the other way around. You need to accept the selected guild by using the mouse (click on the accept button as usual) or using the keybind! This addon will ONLY give you the ability to change your guilds, at the guild bank's / guild store's "Select your guild popup", by help of the keys 1, 2, 3, 4, 5 and the mouse wheel. It will NOT automatically switch to that guild after you have chosen it. You NEED TO manually acknowledge the selected guild by clicking the button or using the keybinding (standard "E")! It will NOT select the guild WITHOUT open "Select your guild popup" (so it will not switch to guild 2 if you press 2 and you are at the guild bank's 1 deposit/withdraw panel)! You need to open the guild bank / guild store selection popup first, like normal. 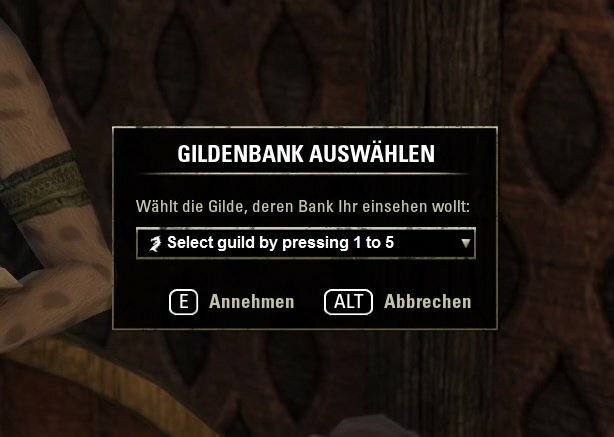 -Fixed bug: Keyboard keys 1 to 5 did not work after the guild bank select dialog was opened the 2nd time. This is fixed now. Thanks to circonian for his code changes and the help! -Fixed keybind problem (thx to Circonian for the hint! ): If a user uses NUMPAD key 1, 2, 3, 4 or 5 to accept/decline a popup dialog this wouldn't have worked for the guild select dialog as it only changed the guild instead. This is fixed now. For the default guild window it should be possible to select your guild by pressing 1 to 5 already. I'll take a look if this is possible too. hello, can you add the same feature for guid store? This is because of Roomba and Stacked addons getting their keybindings together. I reported this weeks ago to the addon authors. It happens most of the time if you have selected guild 1 (nothing happens), then you switch to guild 2 (here the bug appears and no roomba buttons will be there), you switch back to guild 1 and again back to guild 2 and everything is fine again. Should be fixed since last update yesterday. If you open the guild bank selection popup the first time only the mouse wheel is working to select the combobox entry of the guilds. The keys 1 to 5 are not working then. You'll have to close the guild bank selection popup and open it again. At this 2nd time the keys 1 to 5 are working too now. This could be the bug what you mean by "after reloadui it's not woking". Working on a fix for this bug. This addon will ONLY give you the ability to change your guilds, at the guild bank's "Select your guild popup", by help of the keys 1, 2, 3, 4, 5 and the mouse wheel. 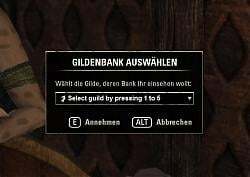 It will NOT select the guild WITHOUT open "Select your guild popup" (so it will not switch to guild 2 if you press 2 and you are at the guild bank's 1 deposit/withdraw panel. You need to open the guild bank selection popup first, like normal. Last edited by Baertram : 04/02/15 at 11:51 AM. You had to setup the keys 1 2 3 4 5 in the controls again because they were not set anymore (for skill 1 to 5 in standard)? Or what do you mean by "and i must again to setup key 1 2 3 4 5"? 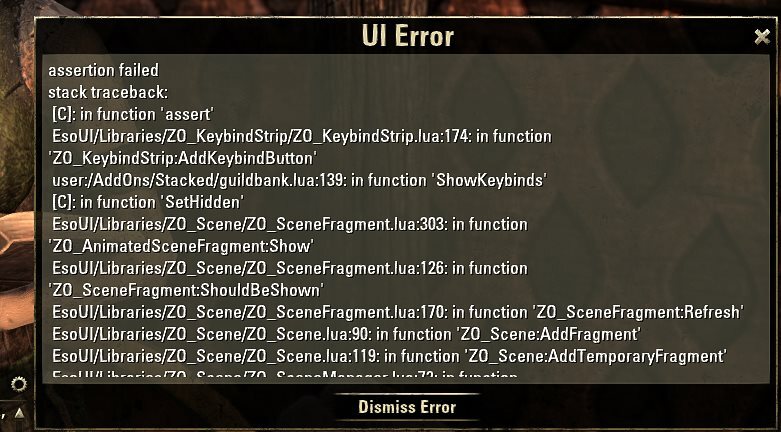 -> This addon is not changing any keybindings nor is it disabling keys. So I can't imagine this happened by the addon. I guess you have changed the controls and after relaodui it was not saved properly.